Known as the Valley of the Sun, Phoenix and its neighboring cities (Scottsdale, Mesa, Tempe, Glendale, Chandler) are warm weather destinations with plenty of ways to enjoy the outdoors with your family. Start your days early, when the temperatures are at their coolest. When the heat really gets unbearable, move inside to one of the area’s indoor attractions. Finally, make sure to plan at least one day, if not two, out of town, exploring the beautiful desert and mountains that surround the city. The Musical Instrument Museum is a great place to escape the desert heat for a few hours. It displays more than 6,500 instruments collected from around the world. Most displays are enhanced by state-of-the-art audio and video technologies that allow guests to see the instruments, hear their sounds, and observe them being played. There are exhibits on contemporary musicians, like Taylor Swift, as well. The museum sponsors family weekend programs with special performances and activities included with admission. Cost: Youth (4-12) $10; Youth (13-19) $15; Adult $20. KidTripster Tip: This museum can be a bit overwhelming with so much to see and hear! Best to focus on just a few sections. Located 40 miles north of Phoenix, Canyon Creek is a great day trip to experience the Wild West as a family. You and your kids can explore the Sonoran Desert on horseback, face off is a quick-draw contest, practice roping, stroll the streets of a old western town, and savor an authentic cowboy cookout. You can also learn to throw an ax, shoot a bow and arrow, and fire real shotguns and pistols in a safe environment. The guides ensure that this tour will be a highlight of your Phoenix vacation. Cost: starts at $75/person. KidTripster Tip: It’s possible to visit Canyon Creek, even in the summer. Just plan your visit for early morning or early evening. Yes, a guided ATV or UTV tour with Arizona Outdoor Fun is pricey, but your kids will be talking about the experience for months! It’s the perfect combination of thrill and education but not in that boring school field trip-kind-of-way. Kids must be 16 or older, 5-feet tall, and at least 100 pounds to drive an ATV; otherwise that can ride in an UTV. I’d recommend the 2-hour tour over the longer options. Cost: $170/person; $80/person for 3rd & 4th passenger in UTV. KidTripster Tip: Opt for a sunset tour to see the sky explode with color. KidTripster Tip: Don’t trust your GPS! Call for directions. Hole in the Rock is worth the stop. Kids can easily hike up to the "window." Ancient desert people, called the Hohokam, used the sun’s position in the window to establish their calendar. For older kids and parents, keep climbing to the very top for great views of Papago Park. There’s plenty of parking here, even for large RVs. The park has shaded stone picnic areas and a rattlesnake-inspired play area. The park is also home to the Desert Botanical Garden and the Phoenix Zoo, though I prefer Wildlife World Zoo in Litchfield Park. Cost: Free. KidTripster Tip: If you want photos without a lot of onlookers, go early. A word about the popular hike to the top of Camelback Mountain, the highest peak in Phoenix: the hike (whether you take the Echo Canyon or Cholla Trail) is strenuous with long stretches requiring you to use your hands to scramble over large boulders. I don’t recommend it for young children. And if you’re taking your older kids, they’ll need to be motivated to make it to the top. Once there, you will be rewarded with spectacular views. KidTripster Tip: Arrive at the Echo Canyon parking area by 6:15 a.m. Seriously. Parking is extremely limited; you won’t find a spot if you arrive much later. And if you want to make it to the top by sunrise, you should give yourself an hour to climb. In addition, you don’t want to do this hike during the heat of the day. Bring a headlamp or flashlight and plenty of water. For the Cholla Trail, it’s street parking only, and you’ll need to walk 1/4- to 1/2-mile to reach the trailhead. KidTripster Tip: As you drive to the trailheads, watch your speed through Paradise Valley. I’ve never seen so many traffic cameras! The Children’s Museum of Phoenix is one of those great spaces where kids are encouraged to touch everything! The museum offers more than 300 play experiences, including a three-story treehouse-like structure, the pedal power car wash, and the kid-run grocery store, all in the heart of downtown Phoenix. It’s a perfect play area on a hot summer day and most ideal for younger kids. Cost: $11. 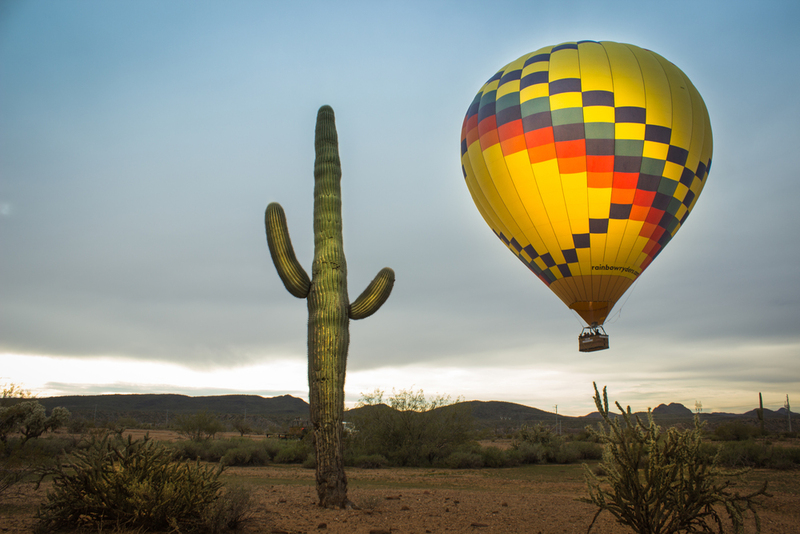 Take a magical hot air balloon ride with Rainbow Ryders. I’d recommend a sunrise or sunset launch, complete with snacks and champagne. The skies here are something else! Kids will love watching the balloon being prepped for lift off. If you’re traveling with grandparents, this adventure is perfect for multi-generational riders. From start to finish, plan on about four hours. Cost: Youth (5-12) $99; Adult $159. Immerse yourself in the life of a butterfly at Butterfly Wonderland, the largest indoor butterfly pavilion in America. Yes, it’s a humid rainforest, but that’s why the butterflies like it! Make sure to catch the Flight of the Butterflies 3D movie in the state-of-the-art theater. There are also exhibits on desert insects, honey bees, and Amazonian fish. Cost: Youth (3-11) $12.95; Adult $19.95. 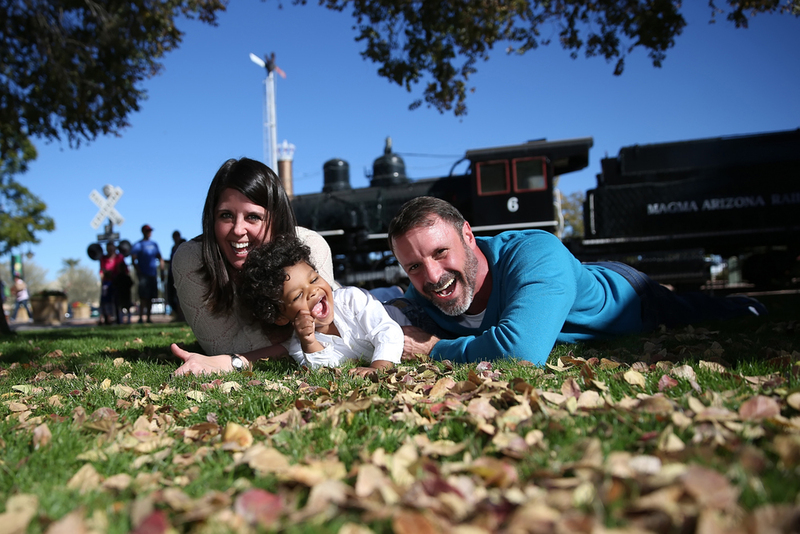 McCormick Stillman Railroad Park is just that, a city park. It’s a great way to entertainment little ones on the cheap. The playground and model railroad building are free. The train ride, carousel, and historical museum cost a few bucks. Don’t forget to stop at the general store for some hand-dipped ice cream. Cost: Free; train/carousel/museum tickets $2 or 6 for $10. Wildlife World is my favorite zoo in the Phoenix area, because kids can get closer to the animals than anywhere else. Feed the lory parrots (free), giraffes (50¢), goats (50¢), and stingrays ($3). Kids love it! The park also has rides like the safari train, log flume ride, and family roller coaster. Unlike most food at other parks, the Kansas City-style barbecue at Dillon’s BBQ is fantastic! It’s worth the trip alone. Cost: Youth (3-12) $16; Adult $37. Step back in time at Goldfield Ghost Town, located about 40 miles east of Phoenix. Tour the historic Mammoth Gold Mine and visit the Goldfield Museum. Pan for gold and then take a ride on Arizona’s only narrow-gauge train. You’ll also witness an old west gun fight, performed by the Goldfield Gunfighters! Mine tour cost: Youth (6-12) $5; Adults $8. Train cost: Youth (5-12) $5; Adult $8. KidTripster Tip: After your visit, keep driving on Highway 88 to Tortilla Flat and stop for lunch at Superstition Restaurant & Saloon. For Top 10 Stays in Phoenix, click here. For Top 10 Eats in Phoenix, click here. Editor Shellie Bailey-Shah travels with husband and two sons. And yes, she did make it to the top of Camelback Mountain.